This indulgent treatment includes a purifying foot bath, relaxing Shiatsu massage chair, while incorporating warm compresses and a blend of salts, mandarin fruit acid with honey to exfoliate, hydrate, brighten, and tone the skin. 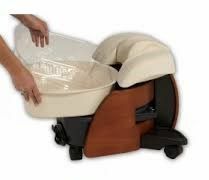 Includes a fantastic tension relief foot and leg massage with warm stones, shaped and polished toenails. Please bring flip flops to wear home. FAQ - Why don't you use a whirlpool tub? Instead of a whirlpool tub, we use the Pedicute by Continuum, making sanitation your biggest priority. The Pedicute offers a safe, worry-free solution to minimizing cross contamination by utilizing disposable liners in the removable tub. The Pedicute has a vibrating aqua massage giving you an invigorating foot soak for a unique and sanitary pedicure experience. The National Association of Eco-Friendly Salons and Spas certified Continuum for their dedication to developing sustainable products. They are the only pedicure spa company to receive this certification due to their use of natural and recycled components and much less plastic than other leading brands. Continuum pedicure spas operate with fewer resources ensuring a better pedicure spa for you and the environment. This indulgent manicure incorporates warm compresses and a blend of salts, mandarin fruit acids with honey to exfoliate, brighten, hydrate, and tone the skin. Includes nail shaping, fantastic hand and forearm massage, and polish application.